The viewing lens sets up the interpretive experience to follow: a land adopted by the Métis. The cut in the landscape leading down to the remains of the East Village and the river, are important to understanding the story. On one wall of the viewing lens, visitors are introduced to the central message through a design that incorporates form, material, didactic content, and the landscape to communicate the issue of a land dispute. The platform's structure is composed of two open CORten steel chambers attached by a slatted cedar stage, all of which appears to float above the landscape. 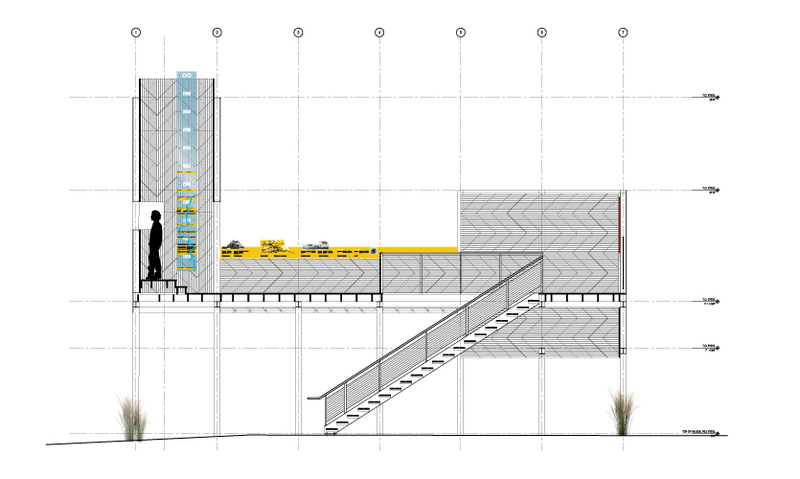 A drawing of the viewing tower which illustrates the scale and placement of exhibit signage. 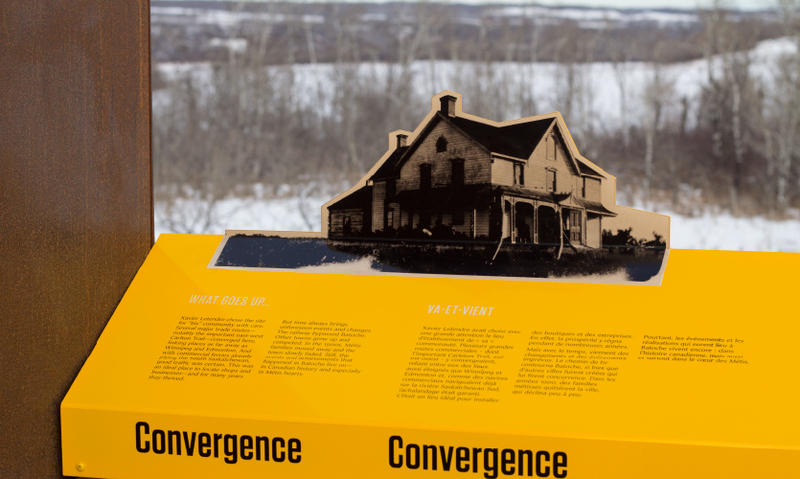 Interpretive panels introduce the early days of permanent settlement and prosperity in Batoche. The painted aluminum panels were screen printed and coated for durability. The way the Form:Media team framed views of the landscape really encourages visitors to read the panels and gain an understanding. The name of the town was derived from the nickname of its founder, Xavier Letendre, who originally built on lot 47. A detail of the 15-foot-high timeline that extends into the sky. The trade route playground is a three-dimensional scaled map, with trading posts and Métis communities identified by large upright log markers. 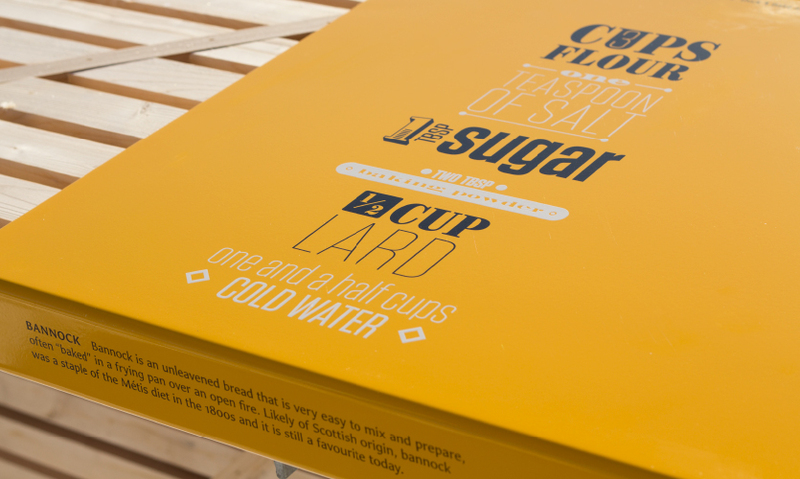 Graphically, the recipe panels are evocative of 18th and 19th century posters, intended to be photographed and shared via social-media. 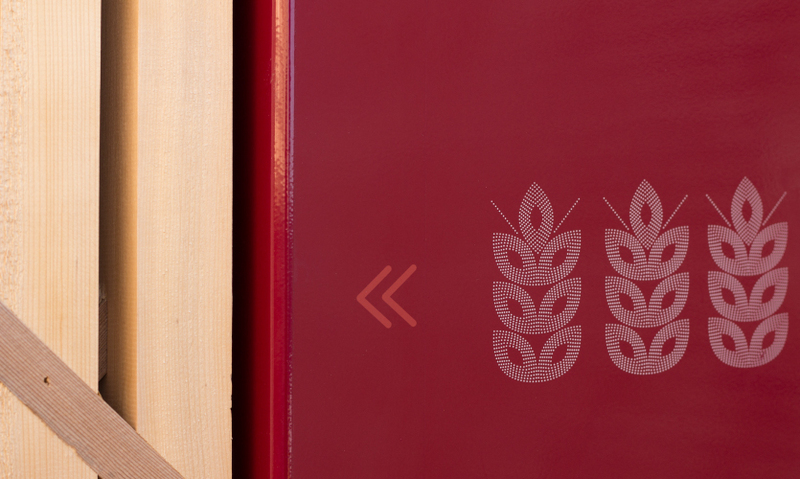 The details provide decidedly modern ingredients and cooking techniques for 19th century meals such as boulettes, bannock, chokecherry syrup, and saskatoon crumble. 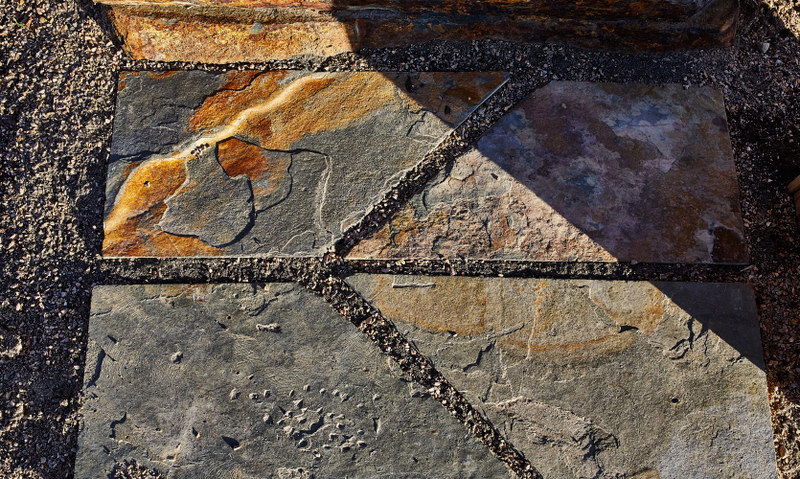 From panels to pavers, graphic elements are consistently applied throughout the site. The Parks Canada Agency has been working to increase both revenue and visitation to parks across the nation as attendance has been slipping over the past five years. 2017 marks the 150th anniversary of Canada’s confederation, and Parks Canada saw it as an opportunity to increase awareness of parks and sites by distributing free passes to historical sites and parks like the one at Batoche. The Batoche National Historical Site was designated as such in 1923 and is located in central Saskatchewan on the banks of the South Saskatchewan River. This prairie and aspen forest-filled site stretches for 955 hectares, with only a few buildings left where the community once stood there. 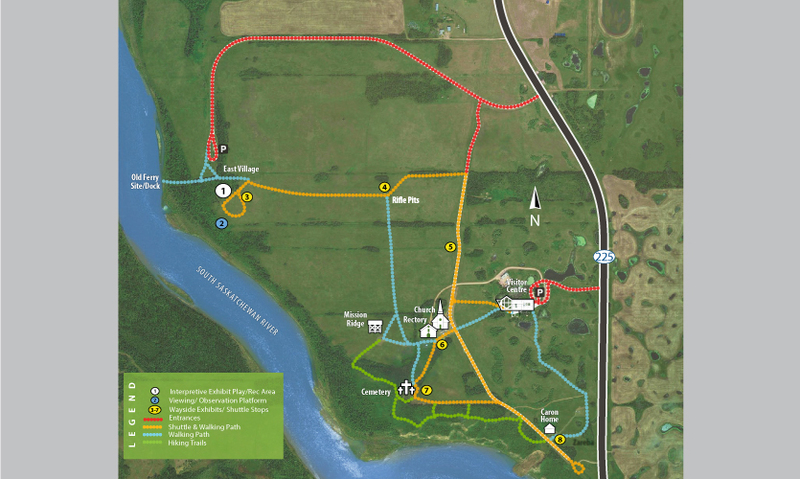 The site is currently government land managed by Parks Canada in collaboration with the Métis Nation of Saskatchewan. 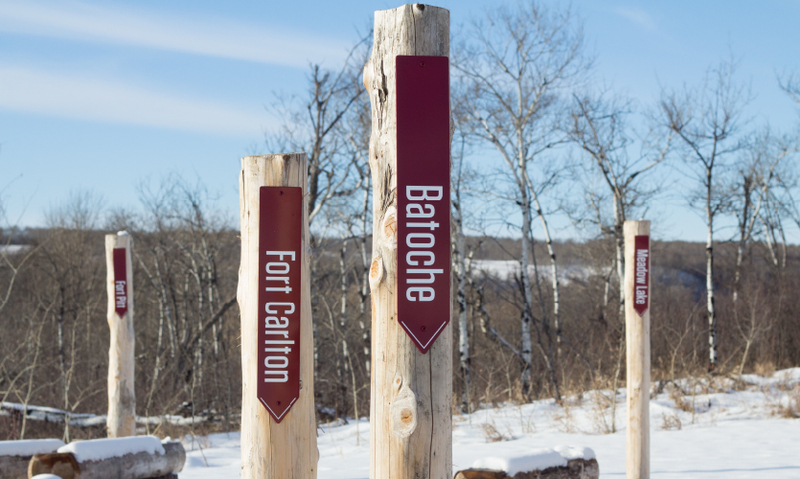 Parks Canada’s intention for Batoche is to establish it as a leading tourist and community destination, requiring a substantial investment in infrastructure and development of an effective installation. Both parties agreed that the site should present a more complete accounting of Métis culture and history, choosing to commission an exhibit on the landscape rather than recreate the East Village. The Batoche area remains the spiritual capital of the Métis people in Saskatchewan, where they settled when their culture transitioned from a semi-nomadic way of life to an agrarian one with the decline of the American Buffalo and the consolidation of the two Canadian powerhouse trading companies, the Hudson’s Bay and the North West Company in the 19th century. The South Saskatchewan River and the Carlton and Humboldt Trails were major trading routes in the Plains, and the reason Batoche was established in 1872 by a small number of Métis at that crossroads. The name of the town was derived from the nickname of its founder, Xavier Letendre, who built on Lot 47. The settlement quickly developed along the river with Batoche as the commercial center. By 1885, the area was home to 1,200 residents. The burgeoning townspeople became a strong and politically organized force that sought to defend their land rights against the recently established Dominion government of Canada in the early 1880’s. The concern of many in the area was the possibility of the government resurveying and redistributing their river-lot properties. The Métis declared the Provisional Government of Saskatchewan’s independence from the federal government in the Spring of 1885 and several physical battles ensued. Many Métis died in battle and much of the remaining population left Batoche. The government instituted a scrip system with the intention of fairly and legally granting the land to its inhabitants, but the program failed. The linear river-lots in Batoche remain to this day as a testament to the community’s resistance. When the Form:Media and Ekistics team began to work on the Story on the Landscape project, Parks Canada provided a summary of user analyses, based on how they fit in with Canada's national tourism marketing organization’s Explorer Quotient demographics. Explorer Quotient market segmentation tools, which use psychographics to look deeply at people's personal beliefs, social values and view of the world, helped the team better understand the Batoche Market Segment and, combined with their own user research, led them to a fundamental shift in approach: to engage the public by introducing experiential elements. 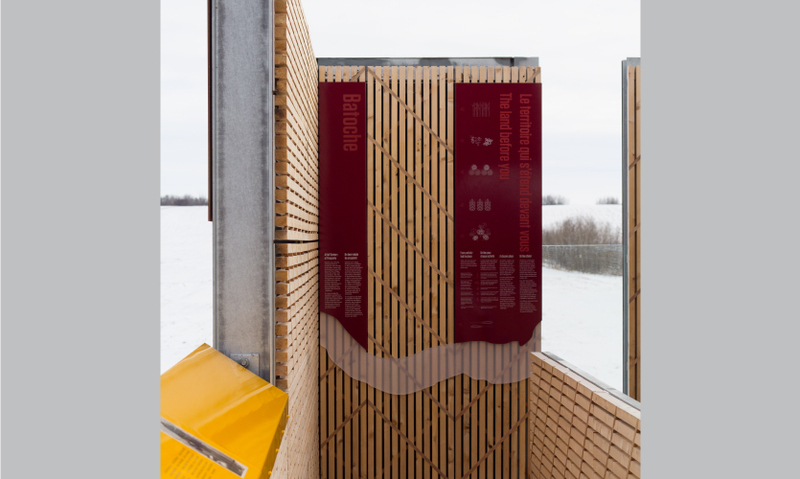 The multi-disciplinary team used the architecture and landscape itself to tell a more complete story of the Métis, with the goal of creating strong connections for visitors with the people, the culture and the river, before and after the fateful battles. Instead of treating the land as inanimate and placing elements at points along a circulation route, the landscape of lot 47 would function as the primary character in this story of a culture. They planned to accomplish this using all elements of design from interpretation to environmental graphic design, architecture, and landscape architecture. “From a tactical perspective, it’s important to recognize how different the approach was: to view the fundamental goal of storytelling from a different lens. To use the landscape as the armature for the story instead of trying to implement a story on a landscape,” says Crawford. The team’s other parti—or big idea—for the exhibit centered on the differences in approaches to land division by the Métis people and Dominion government, the latter being a rigid grid system with a lack of regard for geographic features or inhabitants and the former an insightful plan that accounted for trade routes and river access. 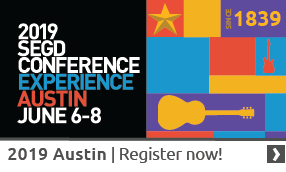 This disparity informed all of the design team’s decision making. Visitors arrive at the Story on the Landscape exhibit atop the hill either on foot or by shuttle bus from other parts of the site and first experience the viewing lens—a partial enclosure that quite literally frames the landscape—that introduces the notion of historical land disputes in Batoche. Then visitors encounter the platform. 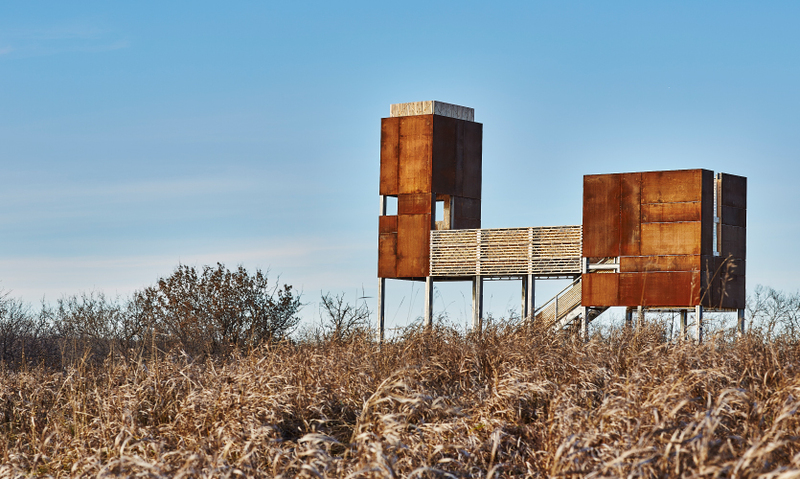 Its structure is composed of two open CORten steel chambers attached by a slatted cedar stage, all of which appear to float above the landscape, supported by pilings dug 50-ft. deep. After climbing a set of stairs, visitors are drawn into an open-air enclosure (Stage East), where a vertical opening from the floor skyward directs the visitor’s gaze toward the hill and viewing lens, framing Lot 47. 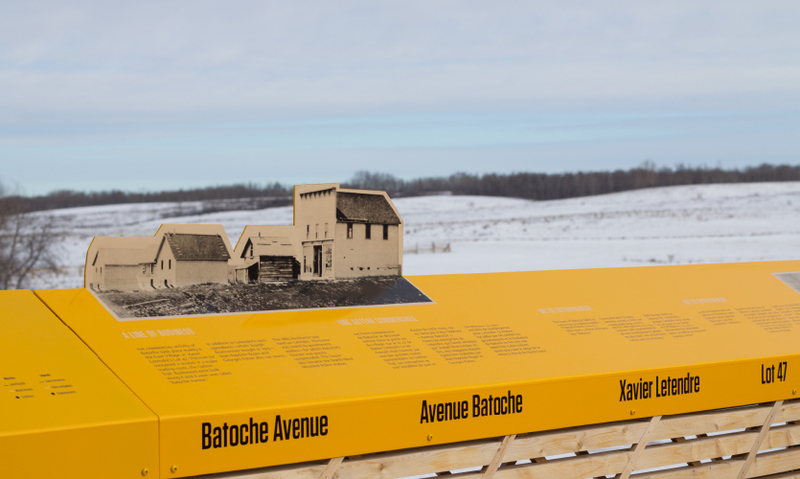 Two interpretive panels introduce the early days of permanent settlement and prosperity in Batoche. 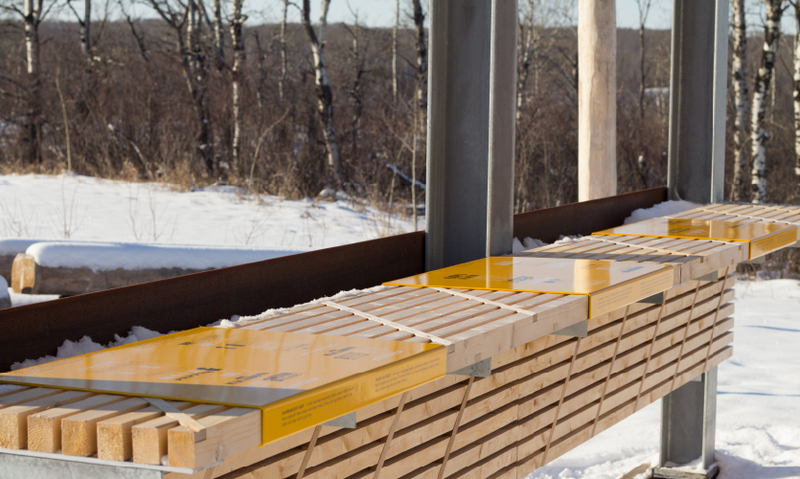 The construction of the platform being dual-bodied conceptually represents the Métis cultural heritage as singular, yet of dual origin. The cedar slats too act as a metaphor, mimicking a planted field and the long linear seigneurial land plots. This pattern of long parallel wooden slats tied together by timber battens also visually refers to Métis weaving culture and specifically the Ceinture fléchée/Assomption sash. “The two woods being combined, using the batons in opposite directions on either side, did an amazing job of creating a really strong wooden frame with very limited use of fasteners,” muses deWolf. The next part of the experience is the elevated, open-air bridge connecting the chambers that runs parallel to the river lot. To the South, there are the South Saskatchewan River and several restored buildings off in the distance; to the North lay the remains of the East Village. 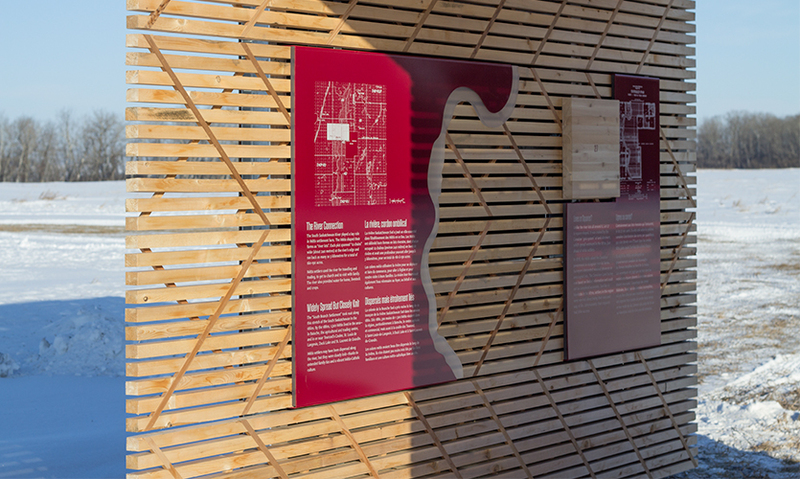 Silkscreened bent aluminum panels wrap the handrail there, illustrating the buildings and trade routes that existed there and are underscored by the trade route playground below. The second chamber (Stage West) presents an uninterrupted view of the river, accompanied by a timeline of painted metal and frosted white acrylic (used throughout to represent water) rising up 15 feet into the open air, as if to suggest an infinite future for the Métis people. Exiting the platform, the Family Garden awaits visitors with engagement, socialization and play. 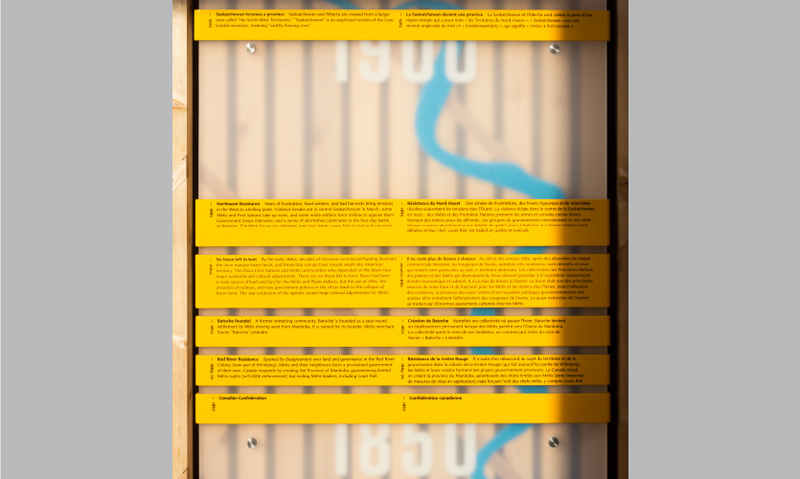 The trade route playground is a three-dimensional scaled map, with trading posts and Métis communities identified by large upright log markers and surrounding rows of Saskatoon berry bushes—an important food staple of the region. The space between the rows is set at two meters, forming a 1:100 scale representation of the Métis river lots and linking to the interpretation on the rest of the site. The berries also allow for a number of seasonal programs for visitors and function as an edible labyrinth. From the outset, the Story on the Landscape project required a high level of sensitivity historically, physically and socially, a situation which posed a challenge for the team. Because the project was born from a desire between Parks Canada and the Métis Nation of Saskatchewan to strengthen ties through collaboration, relationship building was front of mind during the process. An acute sensitivity to how the story of Batoche and the Métis was told was necessary—and especially topical—as the Truth and Reconciliation Committee of Canada had just begun its work with the First Nations, Inuit and Métis communities as well as the larger Canadian population to acknowledge injustices that have occurred. However, due to the sensitivity of using the project to strenghten relations the design team did not have access to all stakeholders, including the shared management board or Métis community, which deWolf says was a very challenging aspect of the project. They did, however, have a great trust their clients’ ability to convey their intent. Initially, there were discussions raised by Parks Canada about how to present information in a “period appropriate” way, but the design team argued instead for an approach that would shift common characterizations. “We successfully argued that every decision—material, form, and content—must be grounded in the intent to change the typical Canadian perspective from thinking of Batoche as a site of the 1885 resistance, to experiencing a thriving culture with the outcome being to ‘make the East Village come alive,’” explains deWolf. The Story on the Landscape project progressed smoothly and it opened in August 2016. 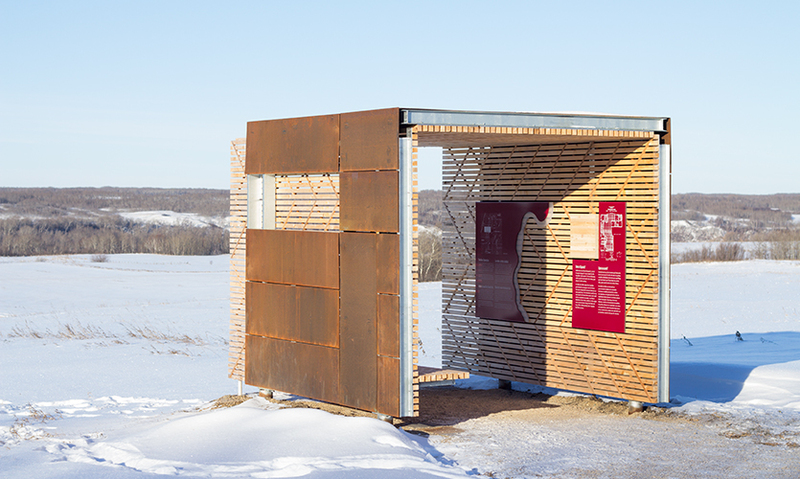 The exhibit uniquely achieves its goal of using the landscape to help the public better understand the historical site and the Métis culture through a weaving together of design disciplines. Subconsultants, Fabrication, Installation: Skyline Atlantic Canada,SweetCroft Engineering Consultants Ltd., Elance Steel Fabrication Co Ltd., Mennie Design & Build Ltd.
Special thanks to John deWolf, Chris Crawford, Adam Fine and the Form:Media team for their contributions to this article and for providing a wealth of research and resources.